Though Kilfian may have won on a scoreline of 3-9 to 0-8, the game will be remembered for a shocking decision to award a second goal to the away team in the first half. 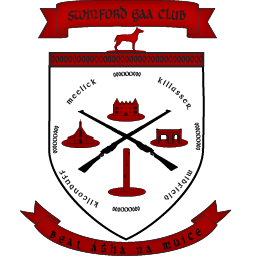 Many of the Swinford team were playing their second game in less then 24 hours and we started the game with only a squad of 15 men the intensity of the game proved in the last ten minutes as many of our men had nothing left to give. Ryan Convey got the game off to a good start with a point with the first attack but the visitors came down the other end and left Sean Kavanagh with no chance as a bullet of a ball was kicked into the top corner. Liam Moran then continued where he left off last night with a fine point. From there Kilfian kicked 7 wides on the trot before they got the next two points to leave the goal between the teams. Liam Moran continued his fine form with another point before Kilfian kicked a ball into the Swinford area that was hacked towards the goal but kicked clear by Sean Kavanagh only for the umpire to raise the green flag. It clearly looked as if the ball was no where near the goal line but despite protests the goal stood. Liam Moran got one back but Kilfian got another point to leave things at the break Swinford 0-4 Kilfian 2-3. Shane Julian who had come to watch the game was called in from the stand to start the second half. We then proved it be equally as wasteful as Kilfian with a number of wides before Kilfian got the first score of the half. Liam Moran puuled one back with a pointed free and then great pressure by our forwards caused mayhem in the Kilfian defence and Shane Julian and Sean Brady capitalised with a point each. Unfortunately that was as close as we could get and Kilfian scored 1-5 to our 0-1 from Kevin McDonagh in the last ten minutes. The last score was to be a Kilfian goal deep into injury time to finish Swinford 0-8 Kilfian 3-9. Swinford: Sean Kavanagh, Alan McLoughlin, Sean Brady, Mark McNicholas, Aiden McLoughlin, Kevin Barry, Andy Lenehan, Ryan Convey, Michael Walsh, Liam Moran, Kevin McDonagh, Joshua Smith, Robert Quinn, Caoimghin McLoughlin, Anthony Friel. Subs Shane Julian.